Potatoes are perhaps one of the largest consumed vegetables across the world. It is considered as the easiest vegetable to be cooked because a single potato can turn around to make a variety of foods such as grilled potatoes, fries and mashed potato. Each one of them has gained an extraordinary importance. However, grilled potatoes are one of the most easily and quick type. The only thing that you have to ensure is to make the skin oiled. 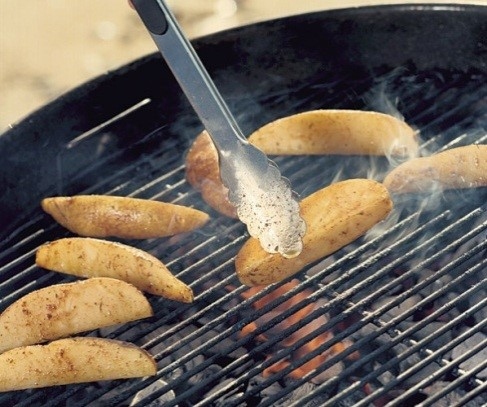 Here we recommend some great grilled potato recipes worth trying. Cut potatoes into 1-2 inch thick slices, boil them in water with salt for a minimum of 10 minutes. Remember that this is not for cooking potatoes, they will remain a little undercooked. Take a saucepan, add oil, herbs and garlic cloves and mix them well. Take the boiled potatoes and put them in the herb oil mixture so that they will form a coat over potatoes. 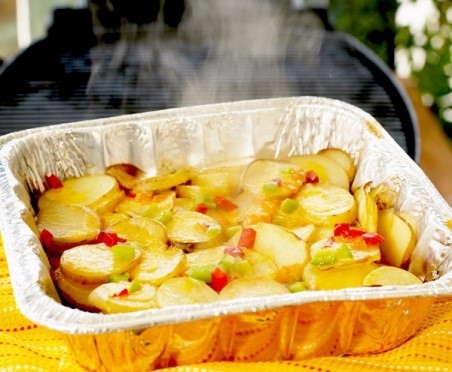 Preheat the grill at slight high temperature, place the potatoes over the grill after draining excess oil mixture. When they have been cooked well on one side, turn around and cook the other side. After complete cooking, put them again in the herb oil mixture, squeeze a lemon wedge and serve hot. Add all the ingredients in a mixing bowl along with the potatoes that have been cut into wedges and mix them well. Place this potato mix in an aluminum foil and wrap with crimping ends. Heat the grill and place the foil over the frill. Leave them to cook for about 35-40 minutes until they become tender. Open the foil to allow the steam to escape, serve hot. Take a piece of aluminum foil (30x8 inches). Place potato chunks in it. Sprinkle salt and add butter and shredded cheese. Fold them in a way that they are covered well. Make some holes so that excessive heat can be removed easily. Place hte foil on heated grill and leave for 35-40 minutes until they become tender. Serve hot with onions on top. In a mixing bowl, mix rosemary, pepper, butter and salt. 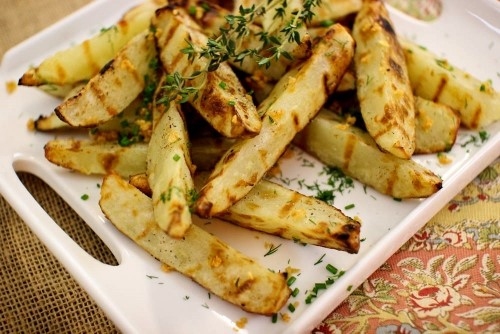 Take potato and cut it into large wedges. Place these potatoes in microwave for 6-7 minutes. Remove them and place them over preheated grill. Make sure that the skin side on the top. When the side is doen (about 5 minutes), turn and cook the skin side for 3 minutes. Add cheese from the top and cook for 5 minutes until the cheese starts to melt. Sprinkle bacon, onion and sour cream and serve. According to serving s (approximately 8). In a microwave safe bowl, add potatoes and water. Microwave at high heat for 15 minutes until they become half cooked and tender from outside. Wait until dry. Mix all the ingredients remaining in a mixing bowl. Place potatoes in the mixture and toss to coat. Cover with a foil and leave for marinating in refrigerator for about 1 hour. Heat the grill, take out the potatoes, place 1 potato in one skewer, then place it on grill to cook. Wait for 6-8 minutes, and then serve hot. Then you get one of the most delicious grilled potato recipes. Take a foil pan and spray it with nonstick spray. The size of foil pan should be 9x9x2 inches. Place all the ingredients in the foil pan and cover with foil lid tightly. Place the pan over the heated grill for 1 hour and rotate after intervals for proper spreading of heat. Once cooked, remove from grill and serve hot in foil pans. To taste (approximately ¼ teaspoon). Take potatoes in a sauce pan and sauté with olive oil until it forms a glistening coat. Grill the sautéed potatoes for 10 minutes with turning once or twice. Add the salt and serve with the following dippers. Puree all the ingredients in a blender such that you add yogurt, peppers, and garlic first then add the remaining ingredients so that they will remain chunky. Heat oil in a pan and cook onions on medium heat. After cooling, place onions and yogurt in a blender. Then add other ingredients. Mix garlic, yogurt and avocado in a blender, then add remaining ingredients.